Agilent has an application programming interface (API) which enables customers to seamlessly integrate outside applications with iLab’s billing and reporting modules. This development is intended for groups who would like to use the API to deliver additional functionality. A sample application that authenticates against the API and performs simple price retrieval and updates is available as a learning resource. Please contact iLab at ilab-support@agilent.com if you would like a copy of the sample application and to obtain your first sets of client ID and tokens. The API is meant to support a number of workflows. Here is an example of what can be achieved. 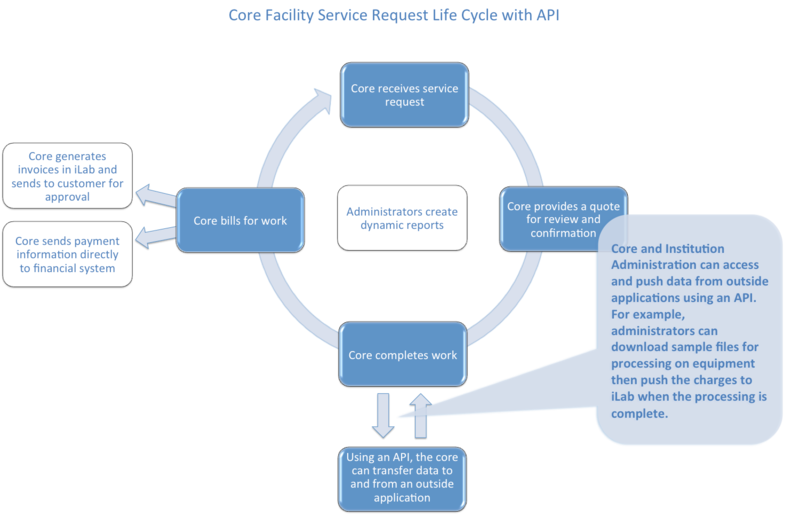 Depending on experiments run, the core updates the quantity of service delivered in iLab through the API and adds any charges that were not included up front.